Tapestries will be displayed along with the history and use of each dye and technique. Featured are natural dyes — indigo, logwood, sappanwood, cochineal, and tea leaves — and various techniques — shibori, batik, ombre toning, painting, and eco-printing. Opening Night Reception October 2, 5 – 7 p.m.
Artists Claire Fredrick and Ashton Page of Wax and Wane Fiber have collaborated with curator Gloria Azucena to produce the workshop series and culminating exhibition. The pieces on display were created by a community-focused process, in which people of all backgrounds explored, learned, and created together. The workshops were presented at the Druid Hill Farmers Market, which draws a diverse and vibrant group of people. Over 70 members of the community participated in creating collaborative tapestries using the natural dyes and fiber techniques. The Conservatory is open Wednesday-Sunday, and there will be an opening reception on Friday, October 2, from 5-7 pm. 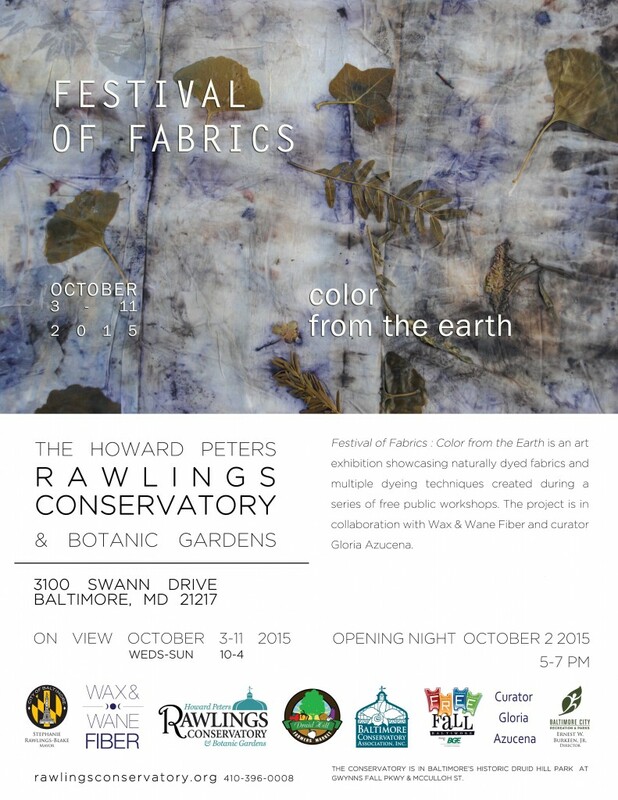 This exhibition is presented by Wax and Wane Fiber and curator Gloria Azucena in partnership with the H.P. Rawlings Conservatory and the Druid Hill Farmers Market. The workshops and exhibit are made possible by the Baltimore Conservatory Association. Marketing support provided by Free Fall Baltimore. A special “thank you!” to Second Chance architectural salvage and home furnishings.